"A movie about those who appreciate the finest things in life... for free!" 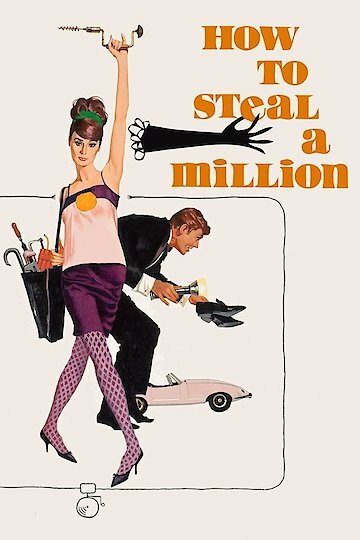 How to Steal a Million is a crime, comedy, and romance film that was released in 1966. The film involves a beautiful young art forger who runs into a cat burglar in a closed down museum. She ends up shooting the cat burglar, but then helps him to avoid going to jail. The cat burglar later tracks her down and proposes that they work together to steal a million dollar painting. The two quickly fall in love while planning the heist of a lifetime, and the film features a number of humorous situations. How to Steal a Million was directed by William Wyler. The film was adapted by Harry Kurnitz, and is based off of a short story that was written by George Bradshaw. The character of the young art forger Nicole is played by Audrey Hepburn. The character of the handsome cat burglar Simon Dermot is played by Peter O'Toole. How to Steal a Million is currently available to watch and stream, buy on demand at Amazon, Vudu, Google Play, FandangoNow, iTunes, YouTube VOD online.